Weight Lifting Capacity 135 lbs. Finally! A light weight automatic lift that is compatible with small vehicles that will only accept a class one hitch! This lift was designed specifically for small 3 wheel scooters such as the Pride Go-Go, Mini Traveler, Buzz Around, Pioneer 5 and many others. Many people purchase a small take-apart 3 wheel scooter because it is easy to take apart and easy to transport in the trunk of a small vehicle, but also because they are unable to attach a lift to there small car. The AL 010 is the answer! 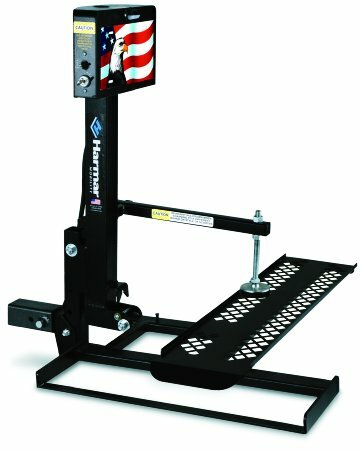 This lift will attach to a class one, two or three hitch with a minimum hitch height of only 5 inches. The Model 010 also has an automatic lock down arm that secures the scooter to the lift automatically, eliminating the use of ratchet straps or tie-down systems. Simply push a button and the platform lowers to the ground. Guide the scooter on to the platform and push a button and the lock down arm automatically lowers to secure the scoter to the platform. At the same time, the platform raises from the ground, and off you go! 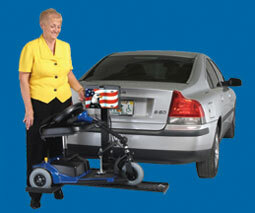 This lift also folds vertically, manually against the back of your vehicle when not in use. 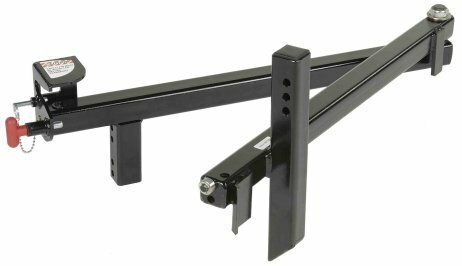 This lift is designed for a class 1 or 2 hitch, but will also work with a class 3 hitch with the purchase of the class 3 adapter. Light weight Micro lift requires only a class one hitch. Works great with small vehicles and small scooters! Fully automatic hold down device safely secures scooter to the platform. Attaches easily to standard class 1 or 2 hitch. A class 3 hitch adapter is also available. 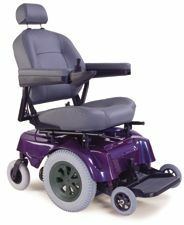 The swing away unit, pictured below, allows you to swing the entire lift to the side, when the scooter is not on it, so that you can access the rear of your vehicle.